Cast: Gabriel Byrne, Marianne Basler, Judge Reinhold, Paul Wyett. Crew: Screenplay: Grant Hindin Miller, Larry Parr (based upon M.K. Joseph's story of the same name); Photography: Alun Bollinger; Editor Michael Horton; Music: John Charles; Producer and director: Larry Parr. 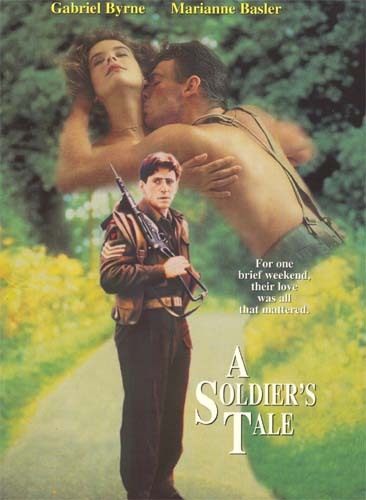 On a weekend leave from the French trenches of World War II, Saul encounters Belle, a beautiful young woman accused of being a traitor to the French Resistance. Against her will, Saul barricades himself in her home in an attempt to hold off her would-be executioners - and the two are slowly drawn into a passionate affair. But their liaison is further complicated by the sudden appearance of an American GI, with his own plans for Belle. The film was to be a co-production, but the French pulled out. This combined with bankruptcy of a contracted U.S. distributor, forced this to fully be a New Zealand production. No known source for PAL vhs copies - either used or new. New NTSC VHS copies will cost about $10us. Used will be about $5us. An R1 NTSC DVD is selling for $10 - 15us. The dvd is presented 1.33:1 with dolby digital 1.0 sound. The only extra is the trailer. There are no subtitles. A PAL R0 dvd is available from New Zealand sources for under $15nz. There are no known soundtrack CDs of this title. 1992 - New Zealand Film Awards - Best Actress: Marianne Basler; Best Soundtrack.